There are two issues that have always been present with Nagios, one technical and the other social. 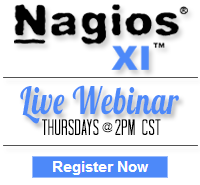 The first is that Nagios is a fairly sophisticated and complicated piece of software, which can make it difficult for new users to get up and running with it quickly, as they have to deal with the hardest part about using it – installation and configuration – first, before being able to play with its abilities. The second is that “Nagios” does not only refer to a single piece of software, but rather an extensive software ecosystem of community contributions around a common framework. As such, it’s common for new users to not even be aware of all of the things Nagios can do, as they initially only see what the core engine can do, without any of those great extensions. To help address both of these, I’m currently working on a project that we’ve dubbed “Nagios Montage”. The idea behind it is to create something that will let new users get started using Nagios immediately, without the hassle of installation, as well as highlighting a number of popular add-ons right off the bat. This will be accomplished by distributing a pre-built virtual appliance with everything installed, along with a default configuration that shows off a variety of capabilities. This virtual machine image is currently slated to include Nagios Core, the Nagios Plugins, the Exfoliation theme, NagVis, the NRPE plugin, Business Process Intelligence, NSCA, nagiosgraph, NRDP, V-Shell, and NagiosQL as a base, possibly with more to be added. This shows of both things that have been around for a long time, like Core, the plugins, and NagVis, as well as some relatively new projects like BPI and V-Shell, plus the latest releases of everything such as the brand new NagiosQL 3.1. In addition to giving users something to make Nagios easier to start using, this can also serve as a common base for deployment and training – a “known quantity” to support. For instance, if you are deploying Nagios instances at multiple remote sites, but don’t have someone knowledgeable about installing it at each of those sites, you could just give them the VM and be all set. Similarly, you might have a need to train people in how to use Nagios who don’t necessarily need to know all of the layers of administering it. In that instance, their time will be much better spent working on a system that’s already ready to go, rather than walking through the installation of every little piece. By including a variety of add-on projects, the hope is that Montage will introduce more people to the true extent of what is available for Nagios, and connect them with the broader community. While there is no way Montage could possibly include every add-on, nor include a subset that fits every person’s needs, by showing a few of the most popular ones and giving a taste of what’s out there users will become aware that there are many to choose from, and will know where to look for more. I’d like to also build in links that direct people to various other community resources, for features, support, development, and learning. Right now the main tasks are deciding what will be including, reading the relevant documentation for those projects, running through their installations and making sure it’s reproducible for future re-builds, getting everything integrated with each other nicely, and putting together a sample configuration. I’d say this process is currently about half done, and we plan to have it completed and available later this summer. Thoughts or suggestions? Leave a comment! Category: Cool Stuff and Nagios Core. 3 Comments Tags: montage. I think that more elegant graphic solution will be to use pnp4nagios instead of nagiosgraph. How is this project progressing?